For Release March 3, 1977 2:00 P.M.
cent decline in new orders in January. producers rose nearly 10 percent or $0.7 million to $7.9 billion. rose 3 percent or $0.3 billion to $10.1 billion. were virtually unchanged in every industry. for release on March 30, 1977.
by a draft on a U.S. bank. Price 30 cents per copy, $3.60 per year. Jan. Dec. Nov. Jan. Dec. Jan. Jan. Dec. Nov. Jan. Dec. Jan. Drugs, soap, and toilet ri. See footnotes at ea nd of tabhl. 2See footnote 2 on table 2. 'ins umer st ......... ...... ....... .
II) 1l n e*. .. .. .
All mi g., t tal.. Item and industry group )ec. 1976- Nov.
Machinery (electrical and nonelectrical . ec. Nov. Jan. Dec. Jan.
1.1-br u I mc'tols .............. ........... ........ .... .
Petroll m nl d coal prodi ts .................... ........ .
NAI Not available. P'rliminary. r v d.rei X!s Not applicable. products. 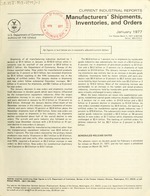 and rubber and plastics products, n.e.c. than the value of shipments. month shipments of the establishments in the industry. complete cancellation of existing orders. for seasonally adjusted data as well as for the unadjusted data.